The Scarlet Macaw is a large and colorful parrot known for its distinctive good looks. They are very social and intelligent birds that are affectionate and form strong bonds with their human caretaker. This bond can cause them to become loud if they are not getting the attention they feel they deserve. Scarlet Macaws are companion parrots that measure 33.1 inches (85 cm) and weigh between 37.1-39.3 ounces (1060-1123 g). Other common names for this bird are Red-blue-and-yellow Macaw, Red-and-yellow Macaw, and Red-breasted Macaw. Its scientific name is Ara macao and there are two subspecies. They are very brightly colored birds with red, yellow, and blue plumage. DNA testing is the only way to accurately determine the gender of your bird. These parrots have a range that extends from Mexico through Central America to northern South America where they prefer lowland rainforest and savannas. The wild population is threatened by unsustainable harvesting for the wild bird trade, habitat loss, and hunting according to the World Parrot Trust. 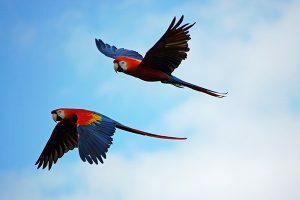 There are currently programs such as Macaw Mountain Bird Park in Honduras that promote releasing the birds into the wild and construction breeding boxes to help the population recover. Scarlet Macaws have bright red heads and red tails tipped in blue. The rest of their body is brilliantly colored in red and blue. They are very inquisitive and will explore and chew anything within reach. While not the best talkers, some will pick up some human words. Household sounds will also be mimicked by these intelligent parrots. What Type of Personality Does a Scarlet Macaw Have? These are active parrots that spend a lot of time in the wild customizing their environment by chewing on branches, according to Cornell.edu. This behavior will continue in your home unless curbed by early training to develop limits. Macaws need plenty of room and toys and branches to chew on. Scarlet Macaws demand a lot of attention and are only recommended for experienced bird owners who can handle and train the bird correctly. Your bird will want to be part of the family and involved in whatever you are doing. They can develop into one-person birds or may even have an aversion to one or the other of the human sexes. More aggressive than other macaw species, these birds are not good around other birds, pets or small children. If another bird is desired, a second macaw would probably be your only wise choice. 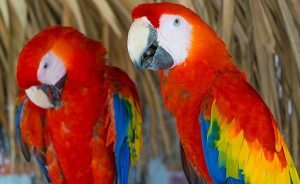 Training is essential with a Scarlet Macaw as you need to teach the bird what is acceptable behavior in your home. With proper training and enough toys to chew, you can limit the potential that they will damage your furniture. Scarlets are loud birds, but the volume and frequency of their outbursts are in tune with their environment. They will be louder in a loud home and will tone it down in a quieter setting. Finding the right treat for positive reinforcement is the first goal when training Scarlet Macaws. In addition to behavior training, they can be taught to perform some tricks and small tasks with patience. Even the tamest of birds may become nippy though, and the formidable beak of this macaw can deliver a powerful bite. How do I Care for a Scarlet Macaw? Your household temperature should range between 70-80°F (21-27°C) for your bird’s comfort. These big birds demand an equally large macaw cage as laid out in our article on cages here. As always with parrots the bigger the cage you can provide the better for the bird, with a minimum of 3x3x6 feet (91.4×91.4×182.8) with 1.5 inch (3.8 cm) bar spacing for your bird. Large stainless steel cages can stand up to the hard use that your macaw will make of its enclosure. Scarlet Macaws mate for life and their breeding season varies based on location and rainy season. Molting usually follows the breeding season. A clutch is from 2 to 4 white, round eggs. Expect to spend two to three hours a day with your parrot out of its cage to maintain its mental and physical health. It needs plenty of space to move around and will not tolerate being restricted all day long. Lack of attention or boredom can lead to excessive screeching and feather plucking. Feed your macaw plenty of nuts, berries, seeds, vegetables, and fruit. High-quality pellets can be used to help provide the bird’s essential nutrients. The birds engage in clay eating in the wild to help eliminate toxins from their bodies. Without that luxury in captivity, their owners need to take care of providing proper nourishment. 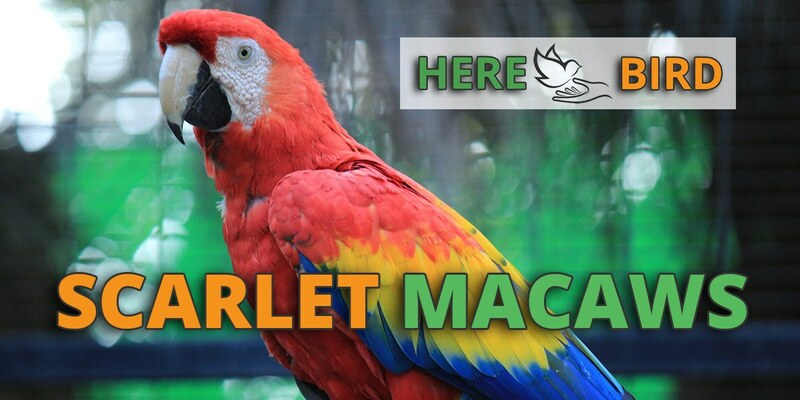 How Healthy Are Scarlet Macaws? A Scarlet Macaw can live for up to 40 to 60 years in captivity. 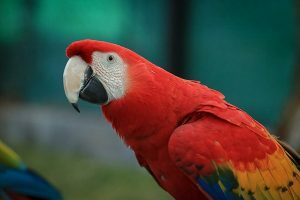 Some common diseases include Macaw wasting disease, parrot fever, kidney disease, and lipomas in older birds. You will pay upward of $2500 for most Scarlet Macaws. Expect many more expenses over the life of your bird. Their cage will be expensive as will the endless supply of chewable objects to prevent the destruction of your furniture. Vet trips and nail trimmings are another expense you will incur. Is a Scarlet Macaw Right for Me? If you have the time and temperament for a loud and attention seeking bird, a Scarlet Macaw can make a beautiful, loving and affectionate companion. They are not an easy bird to handle or care for, and you should only make the commitment after serious consideration.